Serving seafood whole is such a beautiful presentation and has minimal prep. 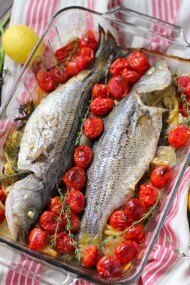 The cavity of the fish is stuffed with lemon, onion, garlic and fresh herbs. As it roast, the fish is permeated all the way through with these aromatic ingredients. The cooked fish is really flaky, delicate and juicy. 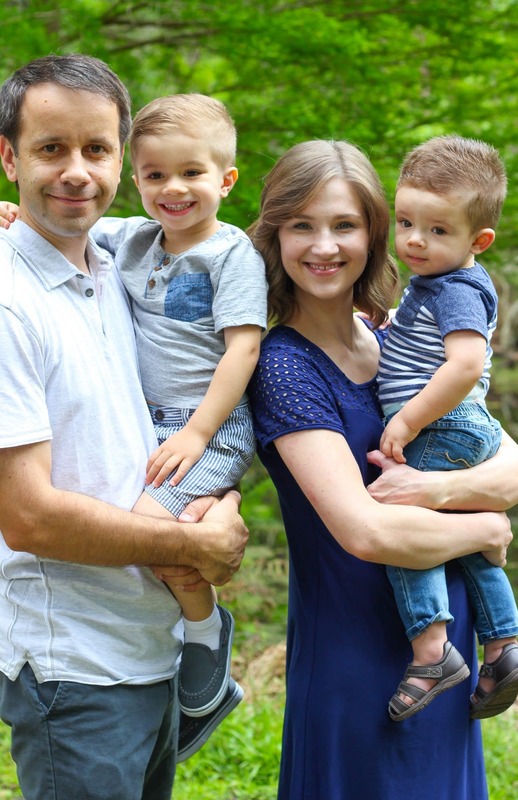 I was grocery shopping one afternoon when Sergi called me to let me know that he would be home late from work that day. As I was passing the fish counter, I noticed these beautiful whole trout catching my attention. I knew this would be the perfect meal for that night. I could whip it up very quickly when he finally came home and it would be on the table in no time, which is a good thing, since we were both famished. Also, we don’t like to eat anything too heavy late at night, so this light and aromatic dish was exactly what we needed. Simple recipes are sometimes the very best in taste as well. The main ingredients really shine. 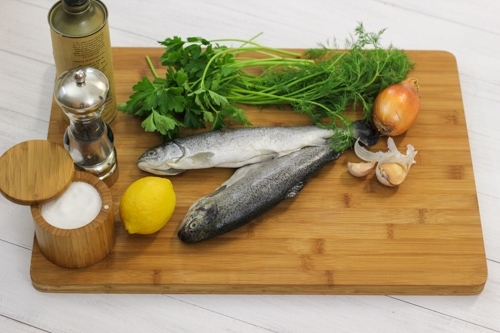 In this case the trout is juicy and tender and is permeated all the way through with the aromatic essence of herbs, lemons, garlic and onions. Served simply with olive oil and freshly squeezed lemon juice, I tell you, it made my tastebuds sing. Serving seafood whole is such a beautiful and elegant presentation. How about serving this on a date night or even when you have company? Everybody will be so impressed and you only have 5 minutes of prep and the rest is up to the oven. 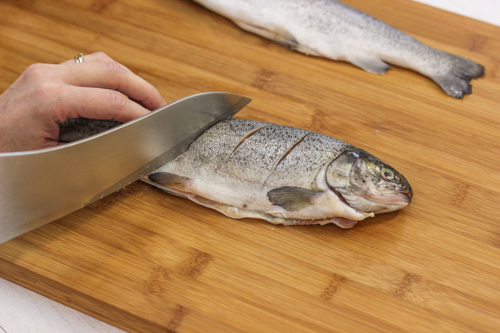 Make diagonal slashes on both sides of the fish. 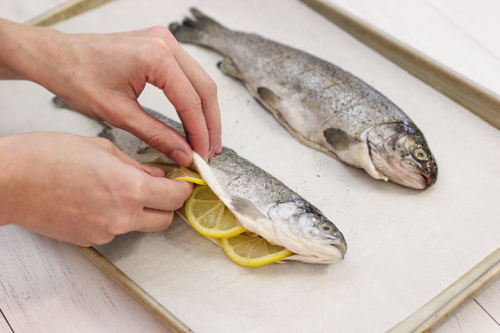 Place the fish on the prepared baking sheet. Season the fish with salt and pepper on both sides and in the inside cavity as well. 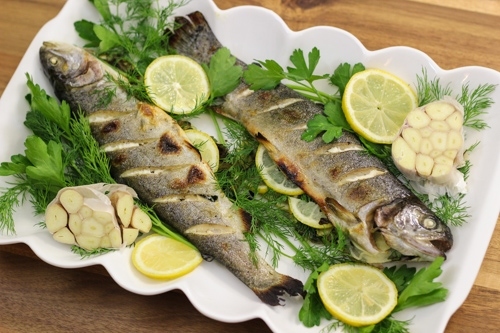 Stuff the cavity of the fish with the slices of lemon, garlic, onion and herbs. 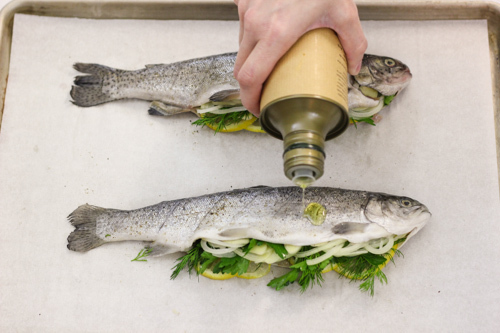 Rub the olive oil over the top surface of both fish. Roast the fish in the preheated oven for 10-15 minutes. Turn on the broiler and roast the fish for another 5-7 minutes, until golden and slightly charred in some places. 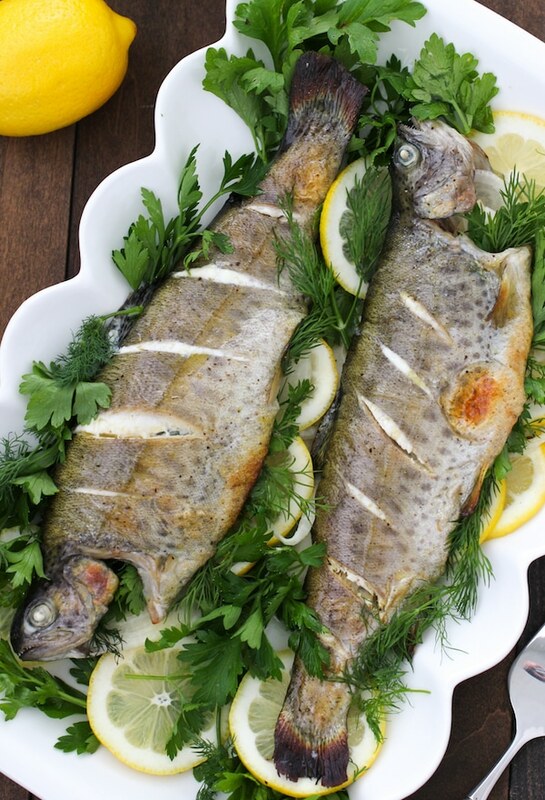 Serve the fish whole, with a bit more olive oil and some freshly squeezed lemon juice. Serving seafood whole is such a beautiful presentation and has minimal prep. 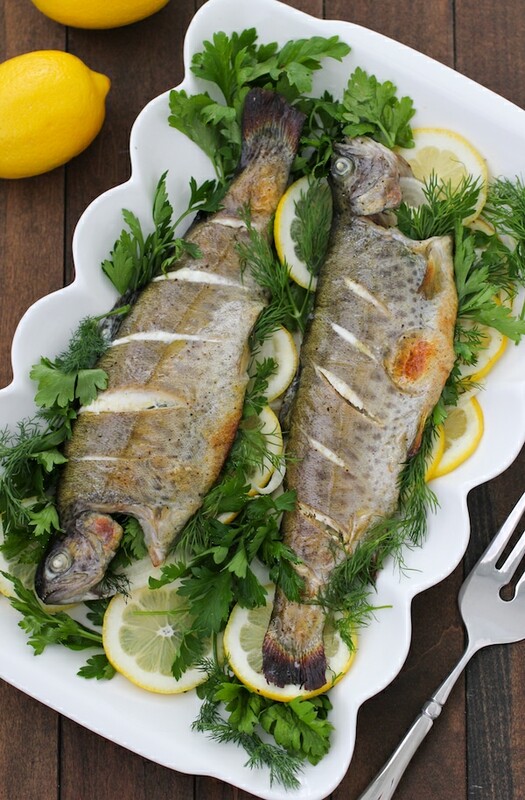 The cavity of the fish is stuffed with lemon, onion, garlic and fresh herbs. As it roast, the fish is permeated all the way through with these aromatic ingredients. The cooked fish is really flaky, tender and juicy. it looks so yummy!!! I will definitely try it! I have never cooked whole fish like this but it looks really delicious! I totally agree with you as far as simple meals. This is such an easy way to prepare it, Anna. My favorite kind of recipe:). Trout is my favorite fish! Very good recipe. Thanks for the excellent recipe! It was my 1-year old daughter’s first experience with fish and she really loved it. I love that, Robert! I’m so happy to hear that. That’s awesome that you’re introducing your daughter to healthy meals:). Love trout! Can i use the same recipe if I have trout filets? Rather than stuffin the cavity, I would layer everything on top? Can’t wait to try it! 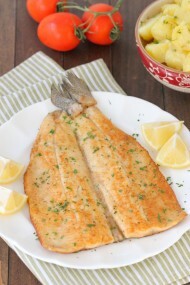 Can I use trout filets rather than the whole fish? 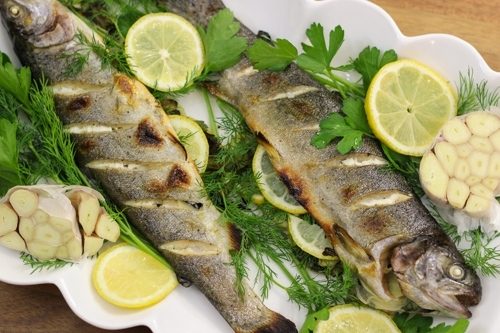 I love trout and this looks like a fantastic, fresh and healthy way of preparing it. Can i layer the ingredients on the filets rather than stuffing the cavity of the whole fish? Also, what do you put into your simple tomato salad? Thanks in advance! That would be a different recipe, Shelly. I would recommend mincing the herbs finely and topping the fish with them instead of using the whole herb leaves. Also, you would have to be very careful not to overcook the fish, since the fillets are so thin, it’s very easy to overcook them. For the tomato salad, I use tomatoes, olive oil, salt, pepper, fresh herbs. Sometimes I add a bit of vinegar to the salad as well, such as balsamic. If I have cucumbers on hand, I add them too. I just wanted to let you know I found this in a Google search and prepared it for Christmas dinner yesterday along with goose. Everyone loved it and the presentation is wonderful. Thank you for this great recipe! I just found this recipe and prepared my trout according to your instructions. I did use my homemade lemon, garlic oil though instead of Olive oil. Smelled so good while roasting & got a nice yummy char under broiler. Reached in to remove pan and WHAM! Dropped the whole pan on the kitchen floor, fish side down. Needless to say my dinner took an unexpected turn. I salvaged what I could and it was delicious. Will definitely make this again on a sturdier pan and wear my elbow length pot holders while removing from oven. Oh yeah, my dogs really liked too! They are great floor cleaners! I have a freezer full of trout to experiment with, and this recipe was my first stab at preparing them. The only thing I augmented was using vegan butter spread instead of olive oil. I havn’t broiled fish before, Ive been missing out! The flesh was not overcooked and slid off the bone easily, plus the skin was so crispy ! Basically, there was nothing left on my plate but bones and a bit of tail fin. Thank you for sharing this! I’m so happy to hear that, Natallia. Hi Olga, that looks so good! 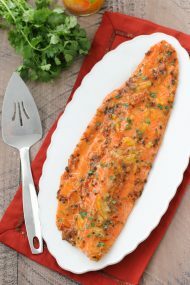 Can I prepare whole steelhead trout that I have on hand using this recipe? Absolutely, Irina. You can use almost any fish using this method:). DO NOT cook it in 450 degrees and then broil it. You’re better off letting it slow cook at 375 degrees for 30-40 min. There are many different methods of cooking, Tom. This is just one of the methods that I use for this particular recipe. Thank you for your input. I often see recipes with parchment paper with a hot, 450 degree oven, but all the parchment papers I see only withstand temperatures to 420. I wonder if this has to do with the chance of fire, or does the paper break down. The parchment paper I use I get in bulk from a restaurant supply store and it works out really well in most cases. Sometimes the paper may break down a bit around the edges, but that’s where there isn’t any food, so you can just simply remove it later. 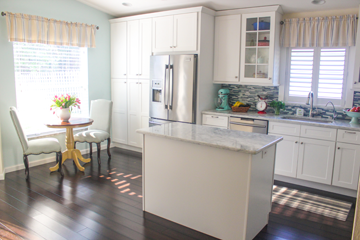 Mostly, I use parchment paper to make cleanup easier later. 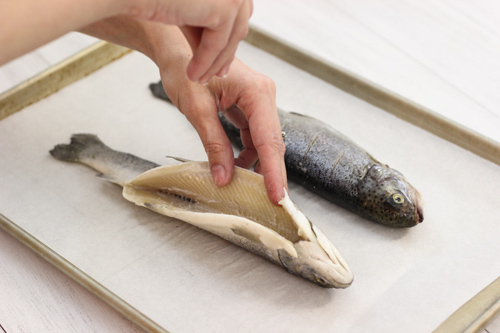 You can just roast the fish on a baking sheet without the parchment paper, if you prefer, but the food will stick to the baking sheet/roasting pan, so you’ll have to do more scrubbing later and the fish will stick to the pan too. 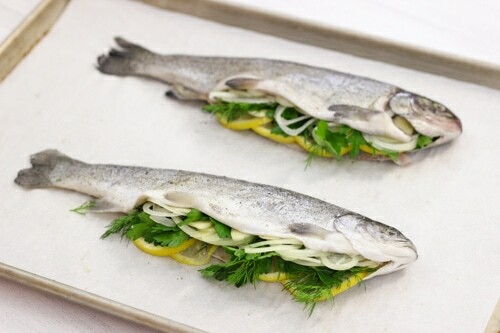 Hi Olga, this is the second time I’m making trout based on your recipe. It’s so simple and comes out absolutely perfect. Thanks for a great fish recipe! I’m so happy to hear that, Elina. Trout is one of our favorites. We made this tonight. Fantastic! Love that your recipes are made with normal everyday ingredients! Thank you Olga! This recipe turned out perfect! 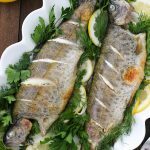 We were given some whole trout and I wasn’t sure what to do with it, found your recipe and followed it to a tee! Thank you so much! Definitely saving this one! I’m so glad to hear that you enjoyed the trout, Barbara! Thanks for taking the time to write. I saw this recipe and was so excited to have a use for the fresh dill I just planted…oops several days ago I guess, be it hadn’t been watered and was shriveled and grey. The recipe was still good with fresh thyme and parsley instead. Also, I was too lazy to dig down to the bottom of my crisper drawer for the onion so I just used some green onions instead. At the last second I tossed a few cherry tomatoes on top and liked their cheerful color and zippy taste. I do wish I had dried the fish well before oiling–the skin would have been crisper–but it was still perfectly yummy and lower calorie than breaded and fried. 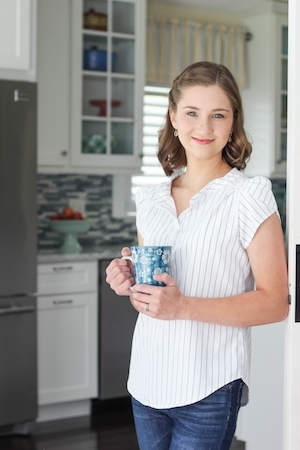 A tasty, forgiving recipe–thanks! I’ll be making it again. I’m so happy you enjoyed the meal, Marta:). Simple, lovely recipe – done this dish today and it was amazing!! Definitely will do again – thank you!! I’m so glad you enjoyed the recipe, Wiga. Thank you for taking the time to write.